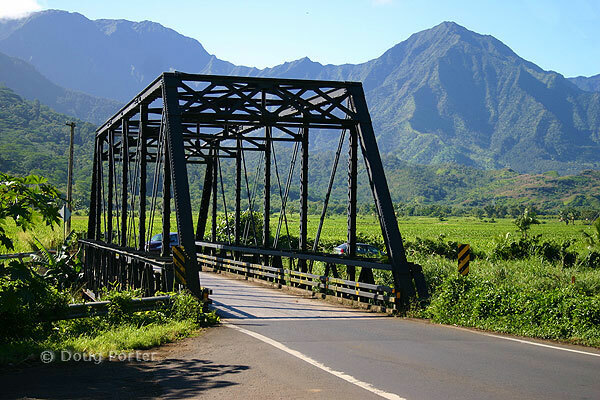 Built in 1912, the Hanalei Bridge on the north shore of Kauai embodies rickety, quintessential island charm. The first of a series of one-way bridges, the Hanalei Bridge marks the way to Ke'e Beach and is still a one-lane gateway to the towns of Hanalei and Ha`ena. Although many proposals have been made to widen and "improve" the bridge, the north shore communities appreciate its charm (and its impedance to tour busses). Because parts of the bridge were wrapped in chicken wire to prevent them from falling into the river below, the local community rebuilt the bridge in 2005 with a structure that closely resembles the original. It is considered a historical monument on the north shore. Nearby vacation rentals include Hanalei Bay Resort and many others in Princeville.